This was at Fred Meyer last week. In summer, we tend to live from our pantry, freezer and garden. 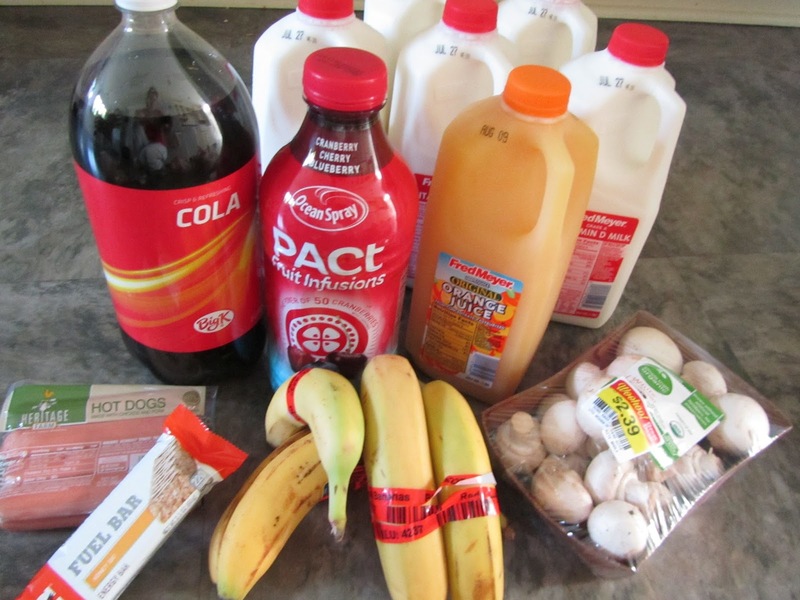 We supplement with purchases of milk, eggs, some produce, and any special deals that I could stock up with. Otherwise, my weekly shopping can be quite small, this time of year. Come fall, I'll make up for it, with some big shops, on a regular basis. 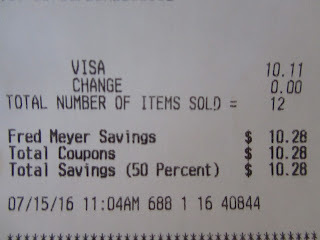 Last Friday, I made a once-every-other-week stop at Fred Meyer. This is how much I got for about $10. I take advantage of whatever weekly freebies I have coming my way. 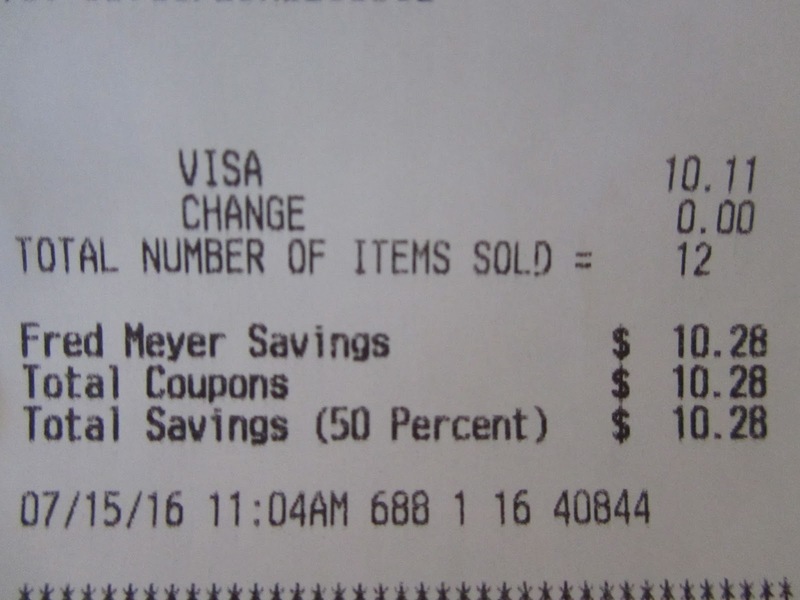 Fred Meyer (and other Kroger affiliates) allow just over 2 weeks to use the freebie coupon. So, if I go shopping on a Friday, just after downloading that week's freebie, I can pick up 3 week's of the free item. Those freebies are usually squirreled away for particular needs in the future. They're often junk/convenience items, so in my book, they're treats and saved as such. I picked up a 2-liter of cola, which will be saved for the Christmas holidays. (Family tradition for us, to have cola wile decorating the Christmas tree.) The PACt juice flavor that I chose was the cranberry-cherry-blueberry. My cranberry crop this year will be dismal. (I'm rejuvenating the bed, and it will take a year or two of good care to get my cranberries back to producing 3 or 4 quarts of cranberries again.) So, with this juice, I'll make a fruit juice jello salad, adding chunks of apples to the cranberry juice gelatin, for our Thanksgiving dinner. 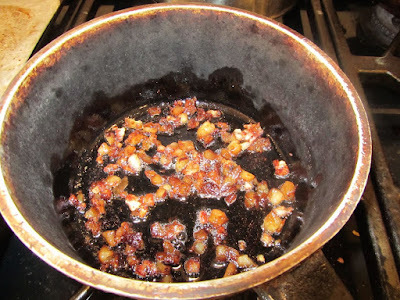 And in place of cranberry sauce, made with fresh berries, I'll make a dried cranberry relish, for Thanksgiving, as well. The Gatorade Fuel Bar was set aside for a long drive my son and his girlfriend made over the weekend. 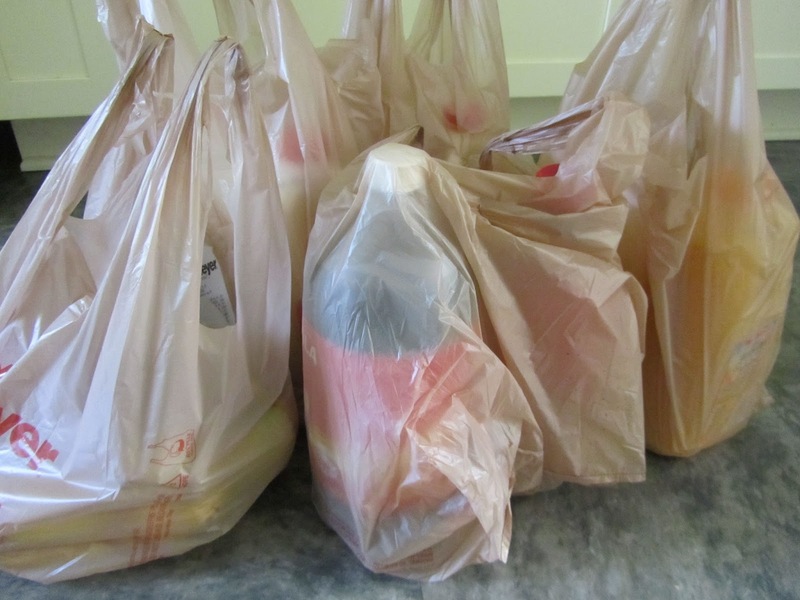 I also bought 5 half-gallons of whole milk, 1 half-gallon of orange juice, 1 8-count package of hot dogs, 1 pound of organic, whole mushrooms, on markdown, and 5 bananas, on markdown. Total spent, $10.11. The cash register receipt reflects the savings of the freebies, and store coupons on the milk and orange juice. It doesn't include the savings on the marked down mushrooms or the bananas. If I include those savings, then my actual total savings would be closer to $12.50. Obviously, one couldn't make a week's worth of meals on what I bought. But perhaps this gives you an idea of how my grocery spending can be so low in summer months. I think I'm just the opposite of you when it comes to summer shopping--my shopping in the summer is higher than in the winter. Kids are home and we use much more than when they are gone all fall, winter and spring. Two are moving to apartments for their college year and so I help them by buying their first load of food. That started this week with some good sales so I have a start on my gift of food to them. The third child is moving to Honduras next month to teach for two years so I won't buy any food for her for two years. In the winter, we use less for the two of us but we also have a freezer that is full and replenished after the summer's harvest. We picked veggies in Dad's garden on Sat. and received 5 ice cream buckets of beans, a bag full of cucumbers, some carrots and new red potatoes, green peppers, and cabbage that dad chopped up for coleslaw. It took us 3 1/2 hours (with 7 helpers) to clean all the produce! It's a blessing but watching my 85 yo dad work through this tells me he should downsize next year. I think it's too much for him. That's a wonderful thing that you do, by stocking your kids kitchens when they first move into an apartment. I can understand how you'd feel about your father still keeping such a large garden. That is a lot of work. But I'm sure on his end, it's a work of love. I'd feel the same way, doing that for my kids. Hopefully he'll feel comfortable enough to tell you when he just can't do that much any longer. Have a lovely day, Alice! That's basically how we shop too, otherwise our food bill would be at least twice as high. Wish we had a Fred Meyer store in our area. Yesterday, we made a 26 mile round trip just to buy hamburger that was on sale at Target, almost five pounds for a little over $8. I paired a B1G1 50 percent off sale with a 25 percent off "cartwheel", then each tray had a $1 off sticker since the use by date was tomorrow. I planned to freeze the hamburger as soon as I got home for when our grandkids are over, so I didn't mind short dated meats, had no discoloration and looked as good as all the others. I think Target routinely puts discount stickers on the older trays to move those out faster. I wanted to shop at Costco across the street, but the parking lot was packed so I knew better than to try to buy a few things on my list on a day like that. At Longs CVS, I think I made an error. I should have just gotten the free after coupon Soft Soap hand soap small bottle, instead I bought a 32 oz bottle for $1.99, after sale and coupon, thinking that was a better deal. In terms of unit pricing, it might have been, but free is free and I should remember in the future that there is no better price than free. I noticed there are so many freebie type deals these days just to get you in the door. Great for us consumers!! Great deal on the ground beef. Most of the marked down meat still looks pretty good, I've found. Only rarely will I see a package that I don't think should still be sold. Otherwise, as long as it's going straight into the freezer, I see no problem with it. Most stores will markdown meat several days before it shouldn't be used. Yeah, the common thinking on using coupons is to buy the smallest size you can, to get a product at near zero cost. But that can depend. For instance if you don't find coupons for that item often enough, then the larger size, at a higher unit price, but still better than you'd find elsewhere, would be a good deal. But we all make some mistakes. It's the end total that counts, and you're doing very well, there. It does make for an interesting shopping cart, doesn't it?! But it's what's working, for both of us. I guess you're doing a version of Christmas in July by buying your drinks for the tree trimming party now. I'll say it again, planning is definitely one of your talents. I never, ever thought of myself as being good at planning. But maybe I've evolved over the years. Yeah, I don't buy soda pop, so when an opportunity to get some for free comes along, I think of the 2 occasions that we could use some, one being for the Christmas tree trimming party, and the other when someone is sick. So, I make sure I get some of both lemon-lime and cola, at some point in the year. I got the lemon-lime last month. Have a lovely day, live and learn! I know, the deals can be quite good, and I do appreciate them. 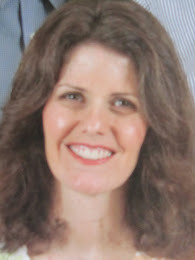 Have a great day, momsav!